After reading "Casey At The Bat" and playing catch with some of the young patients presently residing at The Children's Inn at NIH, Our Washington Nationals John Lannan and Craig Stammen stopped to take questions from a few bloggers attending yesterday's events. This provided an opportunity to have a few moments on the side with Our Number 35 to ponder a few thoughts, especially his off-season rehabilitation of his right throwing elbow. You may recall John Stammen had surgery in September and missed the final few weeks of 2009. “That’s true. We were drafted one round apart from each other in 2005. We played rookie ball together. We were teammates in Vermont, Savannah and Potomac. He’s a little ahead of me in Major League time and experience, but we are friends. We know we can talk baseball and pitching. And we’ve been hanging out together some since the season ended. He asked me to join him and it was a no brainer to come here and be a part of this today." “Everything is on schedule. I am feeling real good. I started throwing this past Monday and I will keep throwing all the way to spring training. Right now, I couldn’t have asked for better help than I have had with Liz Wheeler, who is our physical therapist, Lee Kuntz (Head Trainer) and the doctors. It’s going great. With that final answer Craig Stammen and John Lannan headed off to the Hospital at NIH to meet and greet sick children attending a special Halloween Party. “The children who come here have exhausted all their other options," stated Meredith Daly, Media Relations Coordinator from The Children's Inn at NIH. "This is their last chance. Pediatric Cancer is 87% curable. We get the other 13%. So, the likelihood is that we will lose a lot of these kids." Since 1990, over 10,000 seriously ill children and over 40,000 families have visited The Children's Inn at NIH. Started 19 years ago to provide a support unit for kids from throughout the world--who need the premier medical services only The National Institutes of Health can offer--The Children's Inn's 59 rooms are the temporary homes for those children sick from, not only cancer, but heart, lung, blood, bone and growth disorders, mental illnesses, and HIV infection. It's a daunting task to care for these ill youngsters, while still helping them and their families keep their piece of mind and semblance of life. Raising the spirits of these sick children is an everyday battle, and that is where a recently developed program involving Sports Ambassadors begins at the Bethesda campus. The Ambassadors lend their names and likenesses to The Children's Inn to help raise money and build support groups for the many young patients that come from all our 50 states and 74 foreign countries. For the past two years, The Children's Inn at NIH has worked with all seven Professional Sports Teams in the Washington, D.C. area. The Washington Redskins, The Washington Capitals, The Washington Wizards, The Washington Mystics, The Washington Freedom, D.C. United and now Our Washington Nationals. One-time Redskin Mark Brunell was the very first Sports Ambassador at NIH. Our Washington Nationals John Lannan, the latest. “We were looking for a Nationals representative to join the rest of our athletes and we thought they would be a sports property that wanted to be involved," recalled Sara Stesis, Marketing and Project Coordinator." I called The Nationals and since John also has a program that he was attempting to do on his own (Lannan’s Cannons), we kind of fused the two together." Since the launching of his "Lannan's Cannon's" program this past summer, John has dedicated some of his free time and his own money to the kids and family members at the NIH Campus. Over the last few weeks of the just completed 2009 Baseball Season, Lannan hosted sick children from The Children's Inn and their families during Sunday Home Games. Providing food vouchers and game tickets, John wanted to furnish an escape from the daily regimen of treatments and, hopefully, put some fun back into these youngsters lives. “John has been so generous and he’s not even seen The Inn (until this day), proclaimed Ms. Daly. "This will be his very first visit. He really wants to see what can happen here. He has gone over and above what we originally planned. He contacted us and wanted to set up his visit. We usually get in touch with the team and they set up the schedule. But in this case, HE WANTED TO COME RIGHT AWAY, and was asking when we could accommodate him." Arriving around 4:30PM this afternoon with teammate Craig Stammen alongside, John presented to The Children's Inn at NIH a check for $7,500. The Inn the beneficiary of Lannan's Nomination for the Roberto Clemente Award in 2009 for community service. Then, John and Craig sat down with those children able to come greet them. Whereupon Lannan read to the kids the famous baseball story by Ernest Thayer--"Casey At The Bat". After reading "Casey At The Bat", John and Craig led the entire group outside to the Sports Court at The Children's Inn, where the kids and Nationals Players played catch for a good 20 minutes. Then, everyone was invited back inside where My Best Friend!! Screech!! was in the house to hand out "Build-A-Bear" Screech Dolls and a Baseball Card Team Set of Our Washington Nationals. Lannan and Stammen signed autographs and took pictures with kids and family members alike. John Lannan: “They seem pretty excited and I am very excited to see them too. I am glad we got to come out here and play a little bit. I am staying around here, so I can get out into the community, talk to kids and make people aware that we are here. Baseball has been gone in the D.C. area for some time, so I want to get out and make people aware that we are here and we (The Nationals) support our community." Without hesitation, John Lannan and Craig Stammen walked over to the main hospital at NIH to visit sick children enjoying a special halloween party (pictures were not allowed here). But what John and Craig did provide was an ample amount of fun and joy. Joy which Ambassador Lannan also sees: "Any time you are named an Ambassador, that is just an honor. I want to hold up that title of Ambassador and try to do my best to help these kids out.....we have to show (our) new guys that are coming up (to Washington's Team) that it’s not a pain to do these things. It’s actually fun. You get the chance to meet young kids and you get the chance to meet families in different areas and all walks of life. So, it’s really cool." Yeah, today's visit by John Lannan, Craig Stammen and Screech to The Children's Inn at NIH was not only cool, but special, because this appearance occurred well AFTER the 2009 Major League Season had been completed by Our Washington Nationals. Lannan and Stammen did not HAVE TO BE THERE. They both could have been home relaxing. Instead, John and Craig wished to be different makers, even if only for one day, in the lives of these young children suffering through some of the worst health issues imaginable. 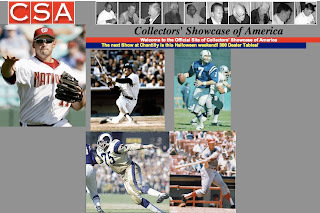 Five Major League Baseball Greats--all with ties to Washington, D.C.--will be among the guests this weekend in Chantilly, Virginia at the Collectors Showcase Of America Event at The Dulles Expo Center. Ryan Zimmerman, Frank Howard, Frank Robinson, Harmon Killebrew & Jim Kaat will be on hand to sign autographs (for various fees) along with a stellar group of Sports Figures from Hockey, Football and Boxing. Lou Brock, Gaylord Perry, Carlton Fisk, Ozzie Smith, Sonny Jurgensen, John Riggins, Charley Taylor, Len Dawson, Bert Jones, Alex Ovechkin, Gordie Howe, Joe Theismann--on and on this impressive list grows. The Football and Hockey Players appearing on Saturday, October 31st. The Baseball Players on Sunday, November 1st. Check the complete schedule for times. Over 300 Dealer Tables selling sports memorabilia and collectibles. Complete details here. Depending on who you might be interested in obtaining autographs from--you will have to plan your visit accordingly. That's the belief of The Jefferson Awards For Public Service. Since 1972, what began as the "Nobel Prize" for civic duty has transformed into a "Call For Action" for volunteers. In an era where individual accomplishments many times overshadow community needs, those involved with The Jefferson Awards believe Americans still have that heart and passion to work with others less fortunate--to better the society in which we all live. Co-founded by Jackie Kennedy Onassis, The Jefferson Awards have transformed over the past 37 years and currently presents national and local awards to Elected or Appointed Officials; Private Citizens; those benefitting the disadvantaged; those providing public service under 35 years of age; and to those for benefitting local communities. Past winners have included Melinda and Bill Gates, Lance Armstrong, Oprah Winfrey, Paul Newman, General Colin Powell and President Jimmy Carter. And now Our Washington Nationals Ryan Zimmerman has been nominated for The All Stars Helping Kids Award to join that elite group--the latest Jefferson Award for Public Service honoring athletes for volunteerism in their communities. Founded by former San Francisco 49er Ronnie Lott--the NFL Hall Of Famer always has believed "I didn't want to walk away from my life feeling that I didn't do enough." His All Stars Helping Kids Foundation is the national recognition program helping to inspire and shape values in youths while honoring athletes for being role models. "We were absolutely thrilled to hear about The Jefferson Award," proclaimed Cheryl Zimmerman, Ryan's Mother. "Even Ryan did not know about the nomination, but he was very pleased that someone has noticed his effort." Our Number 11 was nominated along with 51 other athletes who have given back to their communities. The Z-Man honored for his work with his ziMS Foundation, The Washington Nationals Dream Foundation, The Leukemia & Lymphoma Society, The American Red Cross and The Professional Baseball Trainers Society. Cheryl Zimmerman: "We've only been around for a few years, but knowing others are paying attention and recognizing what Ryan is trying to do--well--that's something we really, really appreciate. You too can participate, by voting online or texting STAR49 to 55333. Voting ends November 15th. 10 Athletes will win spots on the "Dream Team Of Public Service" at the December 8th Sports, Business & Philanthropy Luncheon in New York City. Then, those "Dream Team" Members will be invited to Washington, DC in June, 2010 for The Jefferson Awards For Public Service. Two of whom will be presented The National Awards for "Outstanding Athlete In Service" and for "Outstanding Athlete As A Newcomer To Service". Worth repeating yet again, Major League Baseball in The Nation's Capital, Our Washington Nationals and The Washington Nationals Dream Foundation all provide more to our community than just the baseball played on the diamond. And Ryan Zimmerman has perfectly proven that point. Yes, one person can make a difference. Please Vote for Ryan Zimmerman. Let HIM know, you not only care, but you can make a difference too. PS--Also, it is still not too late to purchase a ticket to The 4th ziMS Foundation Gala in Virginia Beach on November 6th. The November 7th Golf Tournament is sold out, but some $95 Gala Tickets are still available. All the details here. While driving around running errands this afternoon, WTOP announces at 3:15PM that Manny Acta had been named the new Manager of The Cleveland Indians. I shouted out the loudest "YEEEES!!" in some time. This guy stopped next to me at the red light looked over. He happened to be wearing a Red Curly "W" Cap too. This driver says: "What are you so happy about?" 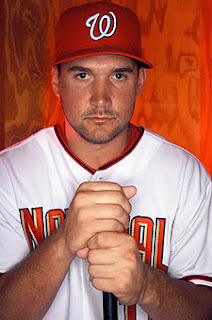 "Manny Acta was just named Manager of The Cleveland Indians," I replied. "Really? Well good for him," this guys stated back. "It wasn't his fault here in Washington." You can dicker over Manny's managerial decisions with his personnel (we've done it here many times--especially over his fascination with Alex Cintron), but "The Most Charismatic Of Men" wasn't responsible for the roster given to him by Former General Manager Jim Bowden. Problems which are currently being worked out by New General Manager--Mike Rizzo. The African Queen was so happy when I called to inform her of Manny's new found fortune--she screamed too. We love that man. We really do. He's one of the nicest people we've ever met in our lives. Hands down, not many come close when it comes to being as genuine as Mr. Acta. Manny Acta deserved another chance and we are thrilled The Cleveland Indians have made him their new field boss for the next three years (with an option for 2013). Good for The Tribe to see past player personnel issues in Washington that ended up costing Our Former Manager his job. And Good for Manny for again keeping positive, pushing forward and landing his second job as a Major League Manager. One of just 30 such positions in The Big Leagues. Too bad The Indians don't conduct spring training in Florida anymore, because Sohna and I would have travelled to see him in February or March. Unfortunately, Cleveland moved their spring headquarters to Arizona a few years back. Of course, if Manny had taken The Houston Astros' job--apparently also offered to him--we would only have had to travel less than an hour from Viera to visit him in Kissimmee--The Astros spring base. But you can bet while every single Media person in Washington, D.C. is circling their calendars for the weekend of June 11, 12 & 13, 2010 when Our Washington Nationals play a three game set at Progressive Field in Cleveland--Sohna and I are looking forward to the weekend of May 14, 15 & 16, 2010. That's when The Cleveland Indians play at Camden Yards against The Baltimore Orioles. With D.C.'s Team in Denver that weekend--The African Queen and I will travel one hour north from our home in Alexandria, Virginia for the series--just to see Manny Acta--"The Most Charismatic of Men" in person and say hello. We can't wait to see him. And his wonderful smile again. Whether this particular player is available and willing to play for Our Washington Nationals in 2010, Phil Wood believes this sure fire Hall Of Famer would be an asset to D.C. Baseball--whether he's near the very end of his stellar career or not. As we conclude Talking Nats Baseball With Phil Wood, the Washington Baseball Historian and MASN Broadcaster and I pick up our conversation talking about John Smoltz and a few other moves Phil believes Washington needs to seriously look into this off-season. 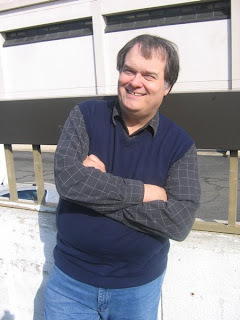 Then, like chats always do--we get off on a tangent and Phil made some points about media coverage and the response that receives among fans in the greater Washington area. And it's at this point in our conversation where Phil and I got off on that tangent discussing coverage of Our Washington Nationals and their Fan Base. “It’s easy for me to be upbeat about The Nationals because I went through The Senators experience when there was no hope. The fact that this year’s club did not lose 107 games means the ’63 Senators were still the worst team of my lifetime (56-106). And you could look at that club in 1963 and look at The Senators Farm System then and know there was no hope back then. There was no hope. They did not grow their own particularly well. They spent no money on scouting to speak of. They scouted amateur players out of college yearbooks, I think (only half joking). That is not something they handled well back then. They made the big trade with The Dodgers (for Frank Howard). Without that trade, that club would have never finished over .500. Without Ted Williams they would have never finished above .500. That was a franchise owner’s owned just to say they fielded a club. That was the Expansion Senators. That was hopeless baseball." “Do I think The Nationals could do more? I've spoken with several club employees who feel the same way. I think there are still too many people who don’t embrace the sport as much as they embrace their job. And those people need to have the riot act read to them or find something else to do. If you don’t love the sport? If you don’t embrace the sport? Then how can you do the best possible job? With that final answer--Talking Nats Baseball With Phil Wood concluded. Phil will be heading to Indianapolis this December to cover the 2009 Winter Meetings. As we were leaving the restaurant in Arlington, Virginia this past week--he shared this funny story about running into another Hall Of Famer at The Winter Meetings--23 years ago. “At the Winter Meetings in Hollywood, Florida in December of ’86, I am walking down a hallway that meets another hallway (running in a different direction). And as I get down to the intersection, I walk right into Ted Williams. We bump together. We each take a few steps back. I was like: ‘hi, hi, hi, hi, hi…..!’. (not knowing what to say)." "As for Ted Williams-- he just kept going." PS--Phil is also of the belief that Washington should sport a pinstripe uniform—whether it be with red trim or blue trim—without the gold. And he agrees with me that the Away Uniform needs to sport a Red Curly “W” on the blue cap to match the Red Curly “W” on the script uniform front. Many thanks to Phil Wood for again getting together and chatting about Our Washington Nationals. Washington Baseball Historian and MASN Broadcaster Phil Wood spent the the first part of our lunch time chat discussing philosophy. What Our Washington Nationals are attempting to accomplish with personnel since Mike Rizzo was named permanent General Manager. And when we concluded yesterday's Part One--Phil was beginning to touch on Mr. Rizzo's recent front office hires. So that's where we pick up today followed by an in-depth look at what Washington currently has and should keep on their 2010 Major League Roster. With that, here we go with Talking Nats Baseball With Phil Wood, Part Two. “Talking about trades, and I bring up The Marlins because they have dealt with Washington in the past. Can you imagine if Josh Johnson was available? From this point on--Phil Wood and I began to discuss specifics about who might be out there for Washington as roster additions this off-season. Free Agents and other creative opportunities that might arise and which General Manager Mike Rizzo might have to consider between now and February, 2010. All that and more coming in Part Three of Talking Nats Baseball With Phil Wood tomorrow. 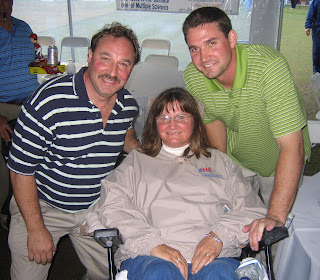 Most fans of Our Washington Nationals know Phil Wood. The Washington Baseball Historian, MASN Broadcaster and columnist omnipresent at Nationals Park covering D.C.'s Major League Team--and Baltimore's too, The Orioles at Camden Yards. Well versed in the game of baseball, Phil and I are sort of kindred spirits. We both grew in the Washington, D.C. area with The Expansion Washington Senators as our team. The '60's Nats were fairly awful record wise (except for that wonderful '69 turnaround), but The Senators were Our Team and Frank Howard was Our Guy!! As Phil likes to always say: "If we went to a Senators game and they lost--but Hondo hit one out--we went home happy." So, very true. We had take what you could get out of D.C. Baseball back then. There was no future for Major League Baseball in The Nation's Capital after 1971 for over 33 years. A far different situation now surrounding Our Washington Nationals since Major League Baseball returned in 2005 and a new ballpark opened in 2008. 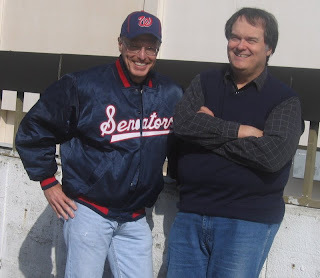 As the 2009 Season wound down--I approached Phil to see if we might get together again and review the just completed campaign and look ahead to what might be in store this off-season for Major League Baseball in the Nation's Capital. He readily agreed and just like last season when we met over lunch for a similar chat, this time we devoted ourselves to just talking about Our Current Nats. Phil Wood and I had lunch together this past Wednesday, October 21st in Arlington, Virginia to talk about all things Nationals. This conversation lasted nearly 90 minutes and is pretty encompassing. Most likely there will be at least three installments, but for sure this is part one. And we begin by chatting philosophy. What Washington is looking for in their managerial search and even from their players? Not necessarily who Mike Rizzo should trade for, or what guy they should sign this off-season. With that, here we go with Talking Nats Baseball With Phil Wood. “For instance, you have the guys that are referred to as ‘baseball rats’—guys who hang around the diamond. They are not great players, but they love it. One good example is a young man that played at Towson State University (Maryland) named Gary Helmick—an infielder that puts the ball in play, pretty good fielder, nothing special in anything that he does and he went undrafted. Well The Orioles signed him as a free agent and they sent him to the minor leagues. He hit around .270 (Rookie Ball). He hit better than many of the guys that were drafted. Everyone talked about him. This guy has got such great make-up. He wants it so badly that he is going to make sure he gives more, as they say, than 100%. It wouldn’t surprise me if in three or four years, Helmick is a utility player on some club in the Major Leagues. And you will know that he got there on his own. He didn’t get there because he is exceptionally gifted. So finding players that are gifted, athletically, as opposed to being just a ‘toolsy’ guy is just as important. Someone said a long time ago, you can have all the tools in the world, but if you can’t figure out how to use them you are not going to help." That answer concludes Part One of Talking Nats Baseball With Phil Wood. Tomorrow in Part Two, Phil & I are going to pick up this conversation chatting about all those front office moves he just mentioned. The realignment of Our Washington Nationals off the field which hopefully sets up an ever brighter future for D.C. Baseball on the playing diamond. There is so much Major League Baseball History represented in this one photo from a late season game between The Los Angeles Dodgers and St. Louis Cardinals played on September 16th, 1963. With two weeks left in the '63 campaign, The Dodgers were holding on to a slim one game lead for the National League Pennant. Yet the outcome of this game (an L.A. Win) played at the soon to be replaced Sportsman's Park in St. Louis is not what is compelling. What is remarkable about this otherwise mundane in-game photo is that all but one person clearly depicted in uniform played a significant historical role in baseball history. And the one that didn't eventually became The Captain of The Washington Senators--and was involved in the best trade the Expansion Nats ever made. The one that brought My Favorite Player Of All-Time! !, Frank Howard, to the Nation's Capital in 1965. I love this photo for the History Makers depicted. And not all of the sagas they represent are pleasant ones. Number 11 with his back to the photographer in this shot is none other than Ken McMullen, the heart and some would say, the soul of the Washington Senators from 1965 through early 1970. The team of my youth. McMullen was a good third baseman with good pop in his bat. And when Senators Owner Bob Short traded Ken away for Aurelio Rodriguez and Rick Reichardt to The California Angels--the official dismantling of Washington's Major League Team truly began. But wait--there is so much more to follow. 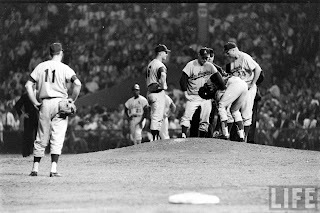 Bending over on the mound picking something up is Johnny Roseboro. The very Dodger catcher who replaced Roy Campanella behind the plate in 1958 when Campy was involved in the horrific car accident which paralyzed the three time NL MVP and ended his career. Roseboro would also be involved in the most violent ON-FIELD incident between two players in Major League History. A well known fracas documented in a special television program currently running on the MLB Network. On August 22, 1965 at Candlestick Park in San Francisco--Roseboro was upset with San Francisco Giants Pitcher (and eventual Hall Of Famer) Juan Marichal. Earlier in that game, Marichal had thrown brushback pitches to Dodgers Maury Wills & Ron Fairly. Roseboro wanted his pitcher--eventual Hall Of Famer Sandy Koufax--to throw his pitches directly at Marichal standing at the plate. The gentlemanly Koufax refused. Upset about no retaliation and taking business into his own hands, Roseboro whizzed his return tosses to Sandy RIGHT PAST Juan Marichal's face. Not taking kindly to Roseboro's too close for comfort throws, Marichal, out of nowhere, raised his baseball bat above his head and proceeded to pummel Roseboro's noggin. Three times Juan Marichal pounded Roseboro's head with his baseball bat, opening up a huge gash that required 14 stitches and started one of the biggest brawls in baseball history. Roseboro survived, played for five more seasons, and ended his career in 1970 as a catcher for The Washington Senators. Marichal was suspended for nine games in 1965 by The National League and fined--what is today--a ludicrously small amount of dollars ($1750) and was banned from playing at Dodger Stadium in Los Angeles for the remainder of that season. Number 6 standing on the mound is none other than Ron Fairly himself. Roseboro's Dodger Teammate and eventual unwilling participant in The Marichal Beaning. But what is interesting about Fairly is that in 1969 he would be traded by Los Angeles to The Expansion Montreal Expos (now Washington Nationals) for none other than Maury Wills. The other unwilling participant and his one time teammate in The Marichal Beaning Game. Ron Fairly would play 21 seasons in The Major Leagues. Fairly would become the very first player to ever play for both Canadian Franchises (Montreal & Toronto). And be the only player EVER to be an All-Star for The Expos and The Blue Jays. The Dodger Pitcher on the mound is Johnny Podres. The winning pitcher in Game 7 of The 1955 World Series. 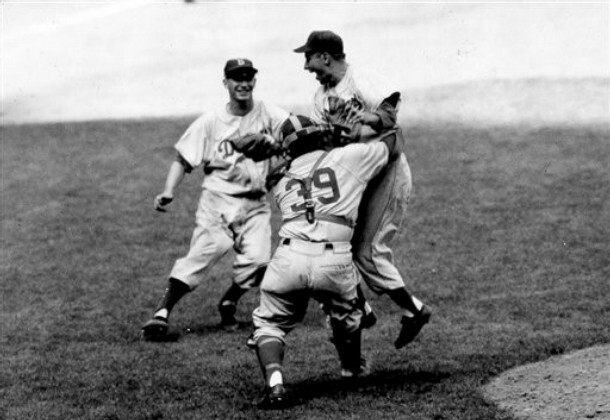 The only time The Brooklyn Dodgers won The World's Championship. The most satisfying moment for any Brooklyn Dodger Fan and The Boys Of Summer. A long awaited Series victory over their arch rival in the American League--The New York Yankees. Number 24 in Dodger Gray Away Wool is Walter Alston. Hall of Fame Manager who led The Brooklyn Dodgers to their only World Series Championship. Then, led The Los Angeles Dodgers to three more World Series Wins and five total National League Pennants after The Dodgers headed west to Southern California after the 1957 season. Alston would manage The Dodgers Franchise their last four years in Brooklyn and their first 19 in Los Angeles. The St. Louis Cardinals player wearing Number 21 is Curt Flood, one of the most important figures for player's rights in Baseball History. A Gold Glove Outfielder, Flood was traded by The Cardinals to The Philadelphia Phillies in late 1969. Flood refused to report claiming Baseball's Reserve Clause (which retained a player's right in perpetuity to the team that originally signed them) was tantamount to slavery. When then Commissioner Bowie Kuhn declined to allow Curt Flood Free Agency (an unknown territory for baseball players at that time), Flood filed a lawsuit against Major League Baseball and sat out the entire 1970 Season. Eventually, Curt Flood would lose his case 5-3 in The Supreme Court of The United States. But ground had been broken and a new era of rights for baseball players was soon to follow. Flood would NEVER receive any of the fruits of his hard fought labor war. Yet every single baseball player that followed in his footsteps did. In 1975, The Reserve Clause was struck down for good by Federal Arbitrator Peter Seitz. A new era had begun in Major League Baseball. Higher and Higher salaries for players was just around the corner. To really understand Flood's importance, a must read is the excellent book written by Brad Snyder that covers Flood's plight and life: A Well-Paid Slave. As for Curt Flood, he would finish his baseball career in 1971 after 13 games with, yes, The Washington Senators. Feeling he was no longer capable of playing and having lost the passion for the sport, Flood skipped out on The Senators and took a flight to Spain--where he stayed for a number years while running a bar in Mallorca. Curt Flood battled alcoholism for a number years before turning his life around. But sadly, died of throat cancer in 1997 at the age of 59. Every single baseball player today owes Curt Flood homage for giving up everything in his life--leading to all the benefits players receive today. Finally--Ken McMullen, Johnny Roseboro, Ron Fairly, Johnny Podres, Walter Alston and Curt Flood--all pictured in the above photo--won a total of 16 World Series Rings between them. And when this game was played that late September night in 1963--The Great Stan Musial was winding down his illustrious Hall Of Fame Career. He would retire at the end of this season. And just three batters before this picture was taken, "Stan The Man" had cranked out the 475th and FINAL Home Run of his wonderful career off Johnny Podres. And oh--one more thing. The 1st Baseman for The St. Louis Cardinals this night (but not pictured here) was Bill White. The seven time Gold Glove Award Winner who would become the very first African-American President of The National League in 1989. The highest ranking minority executive in sports--at that time. History Makers--The Picture Of The Day.